Railpictures.ca - Rob Smith Photo: CN 580 returns to Brantford with a dozen cement hoppers from Princeton. The fish flies are bad, but you should see the size of the butterflies around here! | Railpictures.ca – Canadian Railway Photography – photographie ferroviaire Canadienne. 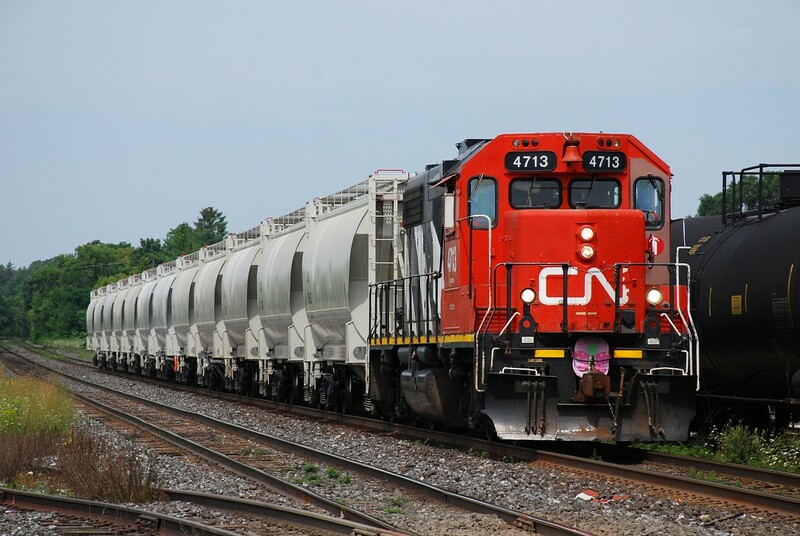 Caption: CN 580 returns to Brantford with a dozen cement hoppers from Princeton. The fish flies are bad, but you should see the size of the butterflies around here! TILX. The couple I looked at were built in 2017. Thanks Rob. Holy cow, that many cars out there at once ?? They look pretty new, who’s are they ? Nice one! Kind of brings back the memory of CN 580 when they ran down the Buford to serve the wax plant by the size of those hoppers. Too bad I still have yet to check out the Burford and it appears that the train goes down “as required” so it’ll be a tricky train to catch (well for me for sure as I’m from Brampton) but hopefully the stars will align for me sooner or later. Anyway thanks for sharing!